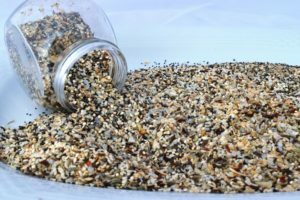 Angie’s Everything Seasoning is my take on the everything bagel spice. Extra ingredients are added which work beautifully together and intensify the flavor. I made this last year for Christmas presents and it was a big hit. 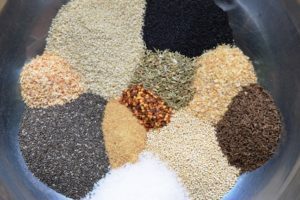 Because everyone has since used all their seasoning, for several months I have had requests to make another batch. Although I think it’s the perfect combination, the quantities of the ingredients may be adjusted to create your own favorite combination. Use this on just about everything – Mix into cream cheese, hummus, scrambled eggs, sprinkle over avocado toast, add to olive oil for a bread dipping oil, brush on pizza dough, scatter over chicken, beef or pork.